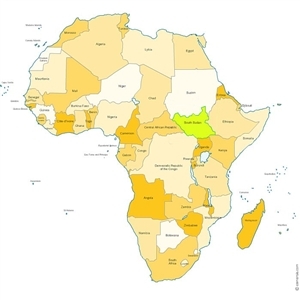 Angola, pictured here in gold on the southwest coast of Africa, is not part of the East Africa Conference that encompasses Kenya, Rwanda, Uganda and South Sudan, shown in bright green. LAKELAND -- Those who follow United Methodist News Service updates may have seen reports of indefinitely suspended funding to the East Africa Conference after a series of audits conducted by the Board of Global Ministries. The East Angola/Florida Conference Partnership is not affected by that decision, said Icel Rodriguez, Global Missions director for the Florida Conference. In fact, the Florida Conference is hoping for stepped-up funding and support as it heads into its 10th year of rebuilding the historic Methodist mission of Quéssua in East Angola. Florida Conference Connection recently posted a report on progress in that war-torn country since the Florida Conference began its relationship with East Angola in 2003. Angola is in southwest Africa and is not a part of the East Africa Conference, which includes Kenya, Rwanda, Uganda and South Sudan. This week, Global Ministries announced it has closed ongoing inquiries dating to 2009 and accepted the recommendation of an independent audit committee that funding to East Africa be withheld indefinitely after finding that the leadership of that conference has been unable to provide "reasonable assurance" that previous money was used as intended. Rodriguez said the Florida Conference took steps several years ago to assume direct oversight of funding to the Angola mission, and all donations go directly to support the education and housing ministries there. "I want people to be reassured that monies from the Florida Conference are being used properly," she said. To read the Global Missions director's blog on this topic, click here.